Holiday at Florida's Legendary Pink Palace, Loews Don CeSar Hotel, on the beautiful St. Pete Beach for an extraordinary get-away; book your stay across WhataHotel! and receive Exclusive Complimentary Perks for an amazing deal. 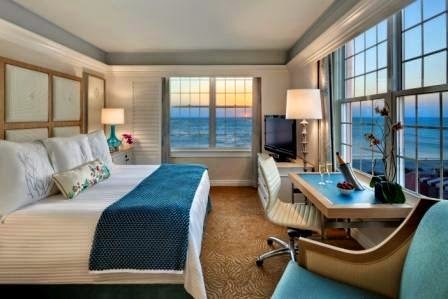 Over the 80 plus years of existence, Loews Don CeSar Hotel has provided guests with glorious accommodations on the pristine beaches of Florida's Gulf Coast. Whether you are looking for the perfect family vacation get-away, a romantic trip for two or need a spot for that very important business meeting, this hotel will not disappoint. Boasting Mediterranean style and prestigious service, Loews Don CeSar Hotel sits like a pink sandcastle on Tampa's radiant beach. Built in 1928, this chic resort is overflowing with a romantic and historic vibe. Guests can stay in one of the 277 recently renovated guestrooms and suites for a relaxing and restful stay. If you are in need of meeting or event space, Loews Don CeSar Hotel has amazing indoor and outdoor venues to meet every need for your celebration or business function. Other amenities include 2 well serviced pools, the 11,000 sq ft Spa Oceana, a spacious 24 hour state-of-the-art fitness center, a children's day camp and Hi-speed wireless Internet available throughout the hotel. The restaurants and bars that call Loews Don CeSar Hotel home are sure to please, offering up delightful meals in stunning surroundings. The Maritana Grille is a four diamond restaurant with a memorable 1,500 gallon salt water aquarium, The Sea Porch Restaurant presents guests with a stylish yet casual setting for a delicious meal, the Beachcomber Bar and Grill gives guests the chance to enjoy a light bite or tropical drink while pool or beach-side and homemade ice cream from Uncle Andy's Ice Cream can help you cool off on a hot Florida day. Escape the ordinary at an old school resort with all of the necessary modern amenities for an incredible stay. When booking your travel to Loews Don CeSar Hotel with the assistance of WhataHotel!, guests can savor Exclusive Complimentary Perks for an unforgettable trip. These perks include a full breakfast for two daily, a room category upgrade at check-in, a $75 hotel credit and options for an early check-in and late check-out. Plan your travel to Tampa's only 4 Diamond beachfront resort where powder white beaches and exemplary service await your arrival.